Παρά το σαφή εργατίστικο προσανατολισμό της ανάλυσης του Wildcat αναδημοσιεύουμε το άρθρο γιατί θεωρούμε ότι φωτίζει με ικανοποιητικό τρόπο τα αποτελέσματα αλλά και τις εσωτερικές αντιφάσεις της πολιτικοποίησης των ταραχών στην Αίγυπτο. For two years, Tahrir Square was the symbol of a radical departure from social ossification and crisis. The military coup in the summer of 2013 ended this phase. The various illusions and hopes were buried with the hundreds that died. Essential parts of the liberal milieus have accepted state-led massacres and mass arrests in the name of ‘defending democracy’. The hope of a state solution to social misery is also lost; the last heirs of Nasserism and trade union movement-hopefuls now sit at the military (side) table. Their vague promises of reform are drowned out by their appeals to peace, order and willingness to work. In the acute social situation there is currently no room for participation. The movement will have to provide new questions about social revolution and organisation and will have to find new answers. To this end, migrants play an important role. With the fall of President Morsi at the beginning of July 2013, the amalgamation of the state and military apparatus with the economy once again became visible. This form of class power emerged at the end of the Nasser era. In the mid-seventies, the military had lost its role as protectors of an ‘anti-colonial’ state industrialisation, and the bloated military apparatus afterwards found itself new fields of activity in the civil economy after the 1978 peace treaty with Israel. A new model of accumulation developed, particularly during the second, ‘neoliberal’ half of the 30-year long Mubarak regime, which was less based on industrialisation, and more on privatisation, the plundering of social wealth and on state-secured investments in infrastructure (transport, tourism, telecommunications). This model was enforced by a gigantic repressive apparatus, which was detached from any ‘democratic control’. This apparatus included an informal army of baltagiyyas (thugs) and the military courts, which had been installed permanently since the state of emergency in 1981. The uprising in 2011 showed the crisis of this model. It is still the case that most of the companies are small and medium-sized enterprises, but they are controlled by a very small layer of society through an old boys network, which means that we are dealing with monopolies. In 2010, around 500 families owned financial assets of more than 30 million USD, while 20 families (the ‘core-elite’) owned more than 100 million. The main economic focus of these groups of enterprises is on construction, telecommunications, tourism, food and pharmaceutical production, and (foreign) trade. At the very top stands the Sawiris family, which owns Egypt’s largest construction company and rules over the telecommunications market and the media sector. In the 2000s this new economic elite took over the high command of political power directly; prime examples being Gamal Mubarak and the Nazif government, which came to power in 2004. Politically, they thereby entered into competition with the military apparatus, which manages the factories of the Nasser-ite epoch of industrialisation (consumption goods and arms manufacturing) and which, in addition, started to participate in the business of mass tourism since its boom in the 1990s. In total the military controls 5 to 15 per cent of the national economy. The military played a significant role in the enforcement of this neoliberal looting because it has the right to confiscate land e.g. for the construction of infrastructure projects, tourist parks, and new industrial zones. This was the cohesive element between the military and the oligarchic elite. The top-layer of the Muslim Brotherhood, which mainly engaged in trade, were part of this arrangement, although, apart from a few exceptions, they were situated rather in the second or third tier. The military and civil top elite is partly Coptic (like the Sawiris) and in general rather secular. The network of clientelism that was directed towards the masses was organised in ‘religious’ terms. After the privatisation in the 90s, the welfare system (benefits for the poor, education and health care) was split off into a completely deficient and corrupt public sector, an expensive private sector and a third sector comprising the various liberal, islamist and christian charities. The vast NGO sector is based on voluntary and informal labour and, in part, directly organises the informal economic sector. A long wave of workers’ struggles in the old industrial sectors (‘Mahalla’) and the lower ranks of the public administration (for example the tax collectors) and in the informal transport sector (taxi and minibus drivers) proceeded the first uprising in January 2011. They were joined by people protesting against daily state violence. On the squares and in the streets, the various social struggles turned into a political struggle. Under the slogan ‘The people want the fall of the regime’, different social layers were united by their determination to change things. They focused on the symbols and figures of the Mubarak regime (‘Mubarak, get lost!’) and avoided a fundamental questioning of power. They tried to curb the power of the given institutions without abolishing them and replacing them with something new. The police were forced to retreat from the militancy in the street, and the ruling power became more cautious. Initially the Supreme Council of the Armed Forces had to officially charge some figures of the elite, and during the climax of the unrest at the end of 2011, the property assets of 260 accused people were frozen. Only four people were actually convicted – the army helped practically all members of the business elite to escape and to transfer their property assets abroad. People demanded the provision and ‘fairer’ distribution of housing by the state by occupying houses and storming town halls. Workers demanded the dismissal of corrupt managers, the withdrawal of privatisations, permanent contracts for workers who had been precariously employed for a long time and wage adjustments. In the public sector, struggles evolved around the demand for permanent contracts and the expansion of employment, given the disastrous condition of the education and health sectors. The struggles in the remains of the state-owned textile industry got a lot of public attention. A diminishing hard-core of workers defended themselves with great determination – but in the end these ‘remnants’ of a bygone epoch were not able to become crystallisation points for a new generation of workers. Political concepts from these old workers’ ranks were demands for the revival of a Nasser-ite state economy: re-conversion of privatised companies into public property and state-planned industrial policies including agriculture, in order to provide raw material for the textile industry. All these struggles took place parallel to each other, they didn’t establish a consistent and practical relation between themselves; the relation was only established once they entered the streets. The manifold attempts to overcome given divisions in workplace struggles did not create organisational forms (e.g. such as ‘councils’ in previous cycles), which would have been able to withhold the counter-attacks. All in all, what was missing was a trajectory pointing beyond the state as a point of reference. Representatives of the urban middle-class tried to use their ability to mobilise ‘the masses’ in the streets in order to fill this political vacuum and to become representatives of workers in the companies. With this lever they entered into a dialogue with the ruling class, wanting to obtain an appropriate chair at the table of power. Not only the liberals, but also the representatives of the political left kept an instrumental relationship to the workers’ struggles: they aimed at administering them in order to be legitimised as (political) representatives. Their misconception of their own importance revealed itself at any of the turning points during which they failed to mobilise the workers for their own ends. The umbrella organisation of the ‘independent trade unions’ has remained a bureaucratic apparatus, largely without any influence on the real struggles. The new political parties of the salafist spectrum were considerably smaller than the Brotherhood. But given the fact that they were the only political force demanding that basic food subsidies and energy should be kept in place, they could reach a part of the rural/small-town poor in the informal sector and in agriculture. The left and the liberals both knew that they didn’t have any social basis of mass support and so no chance of getting government posts. Accordingly, ‘fast democracy’ wasn’t their goal – they wanted to buy some time and in the meantime to be a part of the power structure at the round tables of the military council. With the increasing focus on ‘democracy’, organisational efforts of the movement fell apart. The local committees that had been set up in the days of the revolt disbanded or took over state tasks like the distribution of subsidised propane gas. After the liberalisation of the media, the leading big companies took over mass communication and by doing this, they managed to draw in well-trained and engaged people from the opposition. In addition, parties that were dependent on the big companies now presented themselves as forms of mass organisation. During the parliamentary elections in the winter of 2011-12, the Freedom and Justice Party (FJP) of the Muslim Brotherhood won the elections with less than 4 million votes (with 30 million people having taken part in the elections out of a total of 80 million citizens!) and formed a majority government with other islamist parties. In the summer of 2012, their candidate, Morsi, won the presidential elections. The business elite were not in favour of the take-over of political power by the FJP and the presidency of Morsi, but initially they arranged themselves within it. Their precondition for this arrangement was that the Muslim Brotherhood would be able to channel and control the protest movement. During the first few months, the new government was actually able to create a new hope, less amongst workers, but amongst a considerable share of the ‘middle’ and ‘under classes’, who had large expectations regarding investments of ‘islamist’ financial powers from Turkey and the gulf states, replacing the much hated IMF. Thousands of temporary jobs in the public sector were converted into permanent posts. Referring to the ‘popular will’, manifested in the election result, the government tried to eliminate some representatives of the old regime within the state institutions and, in this sense, to initiate a process of democratisation. But after only a short period of time, the new government failed on two decisive fronts. Firstly, the protests on the streets and in the workplaces continued. The islamic model collapsed because people were not willing to accept a sell-out and bad working conditions just because the investors were ‘islamic’. All attempts to enforce the reforms demanded by the international creditors, e.g. reforms of the subsidies for energy and basic food stuffs, immediately met with angry protests in the streets. This resulted in the drying up of credit money, without which the government was less and less able the keep the remaining industries running and inflation under control; state bankruptcy seemed imminent. Secondly, the government was not able to assert itself against the representatives of the old regime who continued forming part of the high command of state power. Time and again the government announced legal persecution of corruption, but practically they did little to nothing. Nearly all criminal cases were withdrawn by the courts. The government announced the prosecution of crimes committed by the repressive apparatus, but they were helpless when only a few lower-rank police and army officers were sentenced. When the supreme court dissolved parliament in the ‘silent coup’ of summer 2012, it handed over nearly all legislative and executive authority to the army council – the president remained without institutional power. The more the government distanced itself from the movement, the weaker its position was towards the representatives of the regime in the judiciary and administration. Finding themselves between a rock and a hard place, the Brotherhood tried to gain social backing by propagandistically emphasising religious identity – and thereby started a process which allowed parts of the liberal opposition to enter into an alliance with the social elite and the military against their ‘islamisation’. The product of this alliance was the National Salvation Front (NSF), founded in November 2012. 2 At the end of November 2012, a tussle over a new constitution started. In the foreground of the conflict were formulations (which in the end were of secondary importance) regarding the ‘islamist’ character of the state and presidential authority. This superficial power struggle between ‘conservative islamists’ and ‘enlightened liberals’ covered up the actual social contradictions and relations of power. The fact that the FJP replaced some of Mubarak’s people with their own cadres within the institutions, and the fact that Morsi tried to counteract the army council with presidential orders was interpreted as the beginning of an ‘islamist dictatorship’. The fact that the Brotherhood tried to circumvent an unwilling administration by making use of their own structures was seen as a new form of clientelism. When, relating to the question of public order, the Brotherhood finally engaged in alliances with formerly militant groups like Gama’ al-Islamiyya, they added more fuel to the fire. During the first one and a half years after the January uprising, all powers opposed to the revolt were quasi self-evidently (and often simplistically) seen as henchmen of the system. Attacks on demonstrations or killings in the football stadium – it always seemed clear that the military or the oligarchs were behind it. By now, the increasing violence and brutalisation in daily life was seen either as part of a general tendency towards barbarisation or simply declared as an act committed by political opponents. The question of to what extent violence is also an expression of social contradictions is no longer asked. Where do the thugs who attack the demonstrations come from (socially)? Who organises the increasing assaults on women during demonstrations? With the introduction of the ‘virginity test’ in 2011 the military had semi-officially used attacks on women as a strategy against the rebellion. After public outcries against this measure, does the military now continue this strategy in different forms? Are the perpetrators ‘islamists’ (despite the fact that there are many sources reporting that many veiled women became targets of rapes)? Or does the ‘normal’ patriarchal violence in society escalate? Despite this escalation in the political sphere, we saw an increase in the development of social struggles in the first half of 2013. The constantly rising strike wave had two tendencies: on the one hand, struggles about ‘particular interests’ of different sections of workers, on the other hand, modest efforts to coordinate struggles in different companies. There was a nationwide strike in the (public) energy corporation and a strike wave at the airports. Workers in Port Said supported the strike in a cement factory in Alexandria after striking workers had been attacked by the police. The police and the army attacked these struggles with increasing intensity. A growing number of businessmen withdrew their money and brought it abroad, trying to escape the general situation of uncertainty and unrest. Finally, parts of the state apparatus reacted to this scenario by being increasingly obstructive, which led to serious lacks in the supply of energy and to exploding food prices. 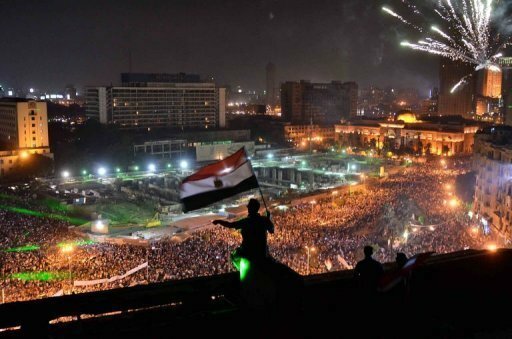 The demonstration on the 30th June in Cairo against Morsi was inflated in the media, which described it as the ‘biggest political demonstration in human history’ with 35 million people participating. Those are certainly pure fantasy figures. More realistic estimates are that 500,000 people at most demonstrated against Morsi in Cairo; in parallel, just as big demonstrations took place in Morsi’s favour. In the run-up, the state apparatus had practically already given the green light to destroy the Muslim Brotherhood’s offices, which, in the course of July happened under the gaze of the police. Against this backdrop, the military coup could be passed off as legitimated by ‘the people’, at the very least to prevent a civil war. Primarily, it wasn’t a coup against the Muslim Brothers or Islam, rather it was against the social movements. Mass shootings at the demonstrations at the end of July and the protests in August, snipers against demonstrators, the mass arrests and the murder of prisoners posed a general threat against anyone ‘taking to the street’. Those Liberals who were lining up behind the military and were calling for unconditional order in the country, were quite open about the fact that the repression was actually about quelling any unrest. Meanwhile, a few people from the campaign realised that if you play with the devil, in most cases you’ll get your fingers burned. The picture has changed from the first big protests that were dominated by the Muslim Brotherhood and the demand for the reinstatement of Morsi. In the face of repression, the demonstrations have become smaller. They were, on the whole, successfully banned for some time in the capital but on a national scale they take place on a daily basis across the country. The slogans are diverse. It seems that things are also being re-shuffled on the ‘islamists’ side of the political spectrum. It’s not about Morsi’s reinstatement anymore, but instead, their protests are targeting the military regime and looking for connections with social struggles. This is surely not just a tactical manoeuvre by the Brotherhood; it is in general questionable as to what extent they’re able to lead the protests after their infrastructure has been destroyed. Furthermore, people who’ve got nothing to do with the Brotherhood are increasingly participating e.g. the ultras. What is the position of the ‘labour movement’ in this constellation? A part of the ‘left wing unionists’ have, in the figure of the new labour minister, Abu Eita, sealed the ‘marriage’ with the military state.5 This alliance is based on the unrealistic promise of ‘modernisation’ and industrialisation. It’s clear that no industrial sector is able to integrate workers on a mass scale. In contrast to other countries like Vietnam, the working class in Egypt is largely (small) town folk and those that live in the rural areas don’t own any means of subsistence to compensate for the very low wages. The modernisation of the textile industry – which in any case is in free fall decline – would make several thousand more people redundant. Therefore, the trade unionists will first of all have to co-manage the closures of the rest of the public industries and take care of the entitlements of those people that have been made redundant. The government has announced mass redundancies, which they plan to administer in a socially ‘responsible’ way (severance payments etc. ), financed by state funds. In future, (peaceful) strikes are supposed to be allowed, but only where it doesn’t hurt the economy. At the same time, the government is relying on populist concessions to the public sector for which they have announced a minimum wage. Here we see the contradictory character of the minimum wage, which the left has agitated for for years. The minimum wage is only for state employees, not for people working in the private sector. The wage amount now is based on an old figure meaning that it is way too low, particularly for the numerous part-time workers. The minimum wage is calculated on the basis of the total ‘income’ rather than the basic working wage, meaning that the minimum wage will include all types of bonuses and social benefits, which up to now has comprised 70-80% of the total income. So for many, the introduction of the minimum wage will result in a lowering of income. All governments since 2011 have addressed the widespread hope of the population, that the state will alleviate the unemployment problem and provide basic benefits. Public sector wages have doubled in the last five years and the number of employees clearly rose (even though in many cases temporarily and numbers slower than the increase in population). A further expansion of the largely inefficient public administration comes up against financial limits. It will take time for all sections of the population to realise what the government programme actually consists of and how small the room to manoeuvre is. In the short-term, the millions of dollars from the Gulf states will help the state to win some time. This will only postpone the problem and ultimately make it worse given the fact that these millions are not gifts but loans, whose conditions are not made public. The regime prepares itself for further unrest. All institutions of Mubarak’s police state are back in place. After the lifting of the state of emergency, a future government will have hardly any influence. It is very important that the movement against the coup (contrary to the official propaganda) has managed, despite all of the repression, to rip apart the dubious legitimacy of military rule through their continuous daily mobilisations that have lasted over the past few months. While in the summer there was still much pondering amongst the left about linguistic creations like ‘coup-volution’ or ‘recoup’, today it’s clear that the unity of the ‘people’s will’ and military rule is imaginary and does not exist. Neither does the assumed subordination of the military to ‘the people’ – an illusion that is the product of a fatal over-estimation of one’s own power. And there’s no scope for reformism. All previous strategies have been exhausted. Egypt and its’ more than 80 million inhabitants is too big to be ‘sustained’ by global capital for political reasons. At the same time, the country is too significant to allow it to fail. This international backing means that the intensified neoliberal authoritarianism won’t be smashed by demonstrations alone. This dilemma reveals itself as much in the failings of ‘moderate islam’ as in the moral bankruptcy of the traditional (‘left’ or social democratic) Nasserism, being as it is, a shareholder of the current military dictatorship. In this drastic period and space of crisis, the working class faces gigantic challenges. What will shape future workers’ struggles? Mahalla and other former strongholds will certainly not be at the centre of struggles anymore, even though there and in other public industrial enterprises, struggles will take place. Finally, will the movements in the region be able to consciously and practically relate to each other? In this regard, migrants will play an important role. Mass immigration, which is a new experience in Egypt’s recent history, can give new impulses for the resistance movement. Since the 1960s, labour migration has closely linked societies in the Arabic region and the Middle-East to the affluent oil-producing countries (Persian Gulf and Libya) and to the trade metropolis of the eastern Mediterranean. Any crisis and any war in this region caused huge waves of migration. The expulsion of migrant populations was not ‘collateral damage’ of foreign political conflicts, but formed a central element of the war of the ruling class(es) against the migrant labour force. The persistence of this order is based on a seemingly feudalistic division between a local upper-class and a foreign under-class. In wildcat no.92 (“Natural born Gulfers…”) in spring 2012, we raised the question of whether a new class composition is emerging within the new movements (“Arab Spring”), which is able to overcome these divisions. We saw starting points of this re-composition in the numerous strikes of migrant workers in the construction sector, sporadic strikes in the new industrial zones and in the struggles for citizen rights of those migrants who live permanently in the gulf states. So far the different concepts of counterattacks against such a possible class re-composition are represented by Qatar on one side and Saudi Arabia, Kuwait and the Emirates on the other. Qatar is an immensely rich small-scale state, which seems relatively safe vis-a-vis internal unrest. In 2011, in alliance with Turkey, Qatar drove forward the militarisation of the uprising in Libya, in order to bring a new ‘national’ elite to power under the banner of ‘democracy’ and to minimise the potential for wider social unrest. One after the other, these attempts to install stable governments failed for various reasons in all countries affected by the unrest, from Libya to Egypt to Syria. As a consequence, the emir of Qatar had to resign in June 2013; in June, as well, the Muslim Brotherhood lost ground in Syria, when Ghassan Hittos was replaced by the Saudi representative Ahmed Assi Dsharba as the leader of the interim government of the Syrian National Coalition; and finally Morsi was removed by the military, which is backed by Saudi Arabia. What followed was a further escalation of the war in Syria and Iraq and an intensified internal repression against the political opposition and the struggles of migrants. This also had an immediate impact on the situation of migrants from Egypt. Since the 1970s Egypt has formed an important labour pool for the region; in 2009 approximately 4.5 million workers from Egypt worked abroad, out of which 2 million were in Libya and 1.3 million in Saudi Arabia, the rest in Kuwait and Jordan. During the civil war in Libya, around 150,000 migrant workers from Egypt flew back to their country of origin. In Saudi Arabia they were frequently threatened with collective deportation – in particular during times when the revolt ‘at home’ led to a stronger self-confidence of the migrant workers, which expressed itself in a series of strikes in Saudi Arabia. Since the coup in Egypt, 300,000 Egyptian workers were thrown out of the country – a further 700,000 are supposed to follow in the coming months. Migrant workers’ remittances have shrunk to a sixth of the amount in 2010. After changes to the visa regulations in Jordan (the main country of destination for unskilled agricultural workers), workers from Egypt were pushed into an irregular status and now have to compete on the labour market with thousands of Syrian refugees. Egypt itself became a destination or transit country for a lot of refugees from Libya, Iraq, Sudan, Somalia, Eritrea, Ethiopia etc.. By now around 300,000 refugees from Syria live in Egypt. The new military government instigates severe animosity towards the refugees and tries to prevent their arrival or deport them. The governments are forced also to attack and to discipline the lower segments of their ‘own’ population. Up to now the Saudi government hasn’t managed to get the Saudi youth to work, at least not under similar conditions to the migrant workforce. For the first time in history the state now simulates a state of emergency outside of a (external) war situation. At the end of March 2012, a new labour law came into effect, which is supposed to get Saudi citizens into jobs that have previously been done by foreign workers. Nearly 90 per cent of workers in the private sector are migrants, while in the public sector 90 per cent Saudis are employed. The program dictates a certain quota of employment of Saudi citizens to the employers – if they don’t stick to this quota they’re supposed to pay penalty fines. In order to enforce this, the labour administration was given the status of a quasi police authority: they can erect street blockades and launch raids. The government has prepared the way for this law by increasing repression against illegal migrants – partly against people who have lived in the country for years or were even born there. Many of them come from Yemen or from east Africa, others have fled from their Saudi ‘contractor’ (legal guarantor) and have looked for other employment in the informal sector. As early as 2012, 800,000 illegal migrants were officially deported, a further 200,000 during the first three months of 2013 alone. Despite this, the law initially failed due to the resistance of the migrants and its implementation was postponed. On 4th of November 2013 the last notice for the migrants ran out. The majority of migrants depend on a so-called guarantor, who employs them, organises their visa and often retains their passport. Due to the quota regulation and the fact that migrants are not allowed to change their employer, a lot of regular migrant workers have become illegalised. They can only ‘legalise’ themselves through their employer. Due to the quota regulation many companies were not able to get new work permissions for their migrant employees; and many companies did not want to procure them, but rather forced workers into an illegal status, which allowed them not to pay them wages for months, given the pending threat of deportation. The wave of repression had drastic economic consequences: businesses had to close down, in the port of Jeddah only 200 of usually 1,000 workers turned up for work, schools had to shut down etc.. At the same time tens of thousands of migrant workers travelled to Jeddah and Riyadh in order to demand money and papers from their respective embassies for their return. Thousands of workers camped publicly in front of the embassies, for example 2,000 workers from the Philippines. First, protest demonstrations took place. In May 2013 around 2,000 workers from Egypt stormed their embassy. In addition protests in the countries of origin erupted: in Yemen the Saudi embassy was the target of week-long protests, similar actions took place in the Philippines and in Egypt. This is why the enactment of the law was postponed to November. In the meantime nearly 4 million workers were able to ‘legalise’ themselves in Saudi Arabia, while one million workers left the country. After the 4th of November in Mecca alone 20,000 people were arrested. There are no figures for the number of people arrested at a national level. The authorities set up checkpoints on the streets, companies were raided, whole parts of town encircled by the administration personnel – mainly the slums where a lot of African workers live. The results were predictable and similar to those in the Spring: half of all construction companies had to stop operations, truck-transport collapsed, in some areas food-supply was at risk, essential public services like rubbish collection and schools became dysfunctional. The resistance of the migrant workers attained a new quality. In April the focus had been on embassies of the home countries but after November strikes were organised targeting Saudi companies. In Mecca and Jeddah thousands of workers working in refuse collection and hospital cleaning went on strike for several days and had violent confrontations with the police. On an airport construction site 400 foreign technicians and engineers went on strike. In the course of the dispute, cars were destroyed and offices attacked. There were riots in various towns, around 50 people died and hundreds were arrested. The trigger was the general attack on people from Africa, which was partly launched by the police, partly by Saudi youth (and other reports mention Pakistani youth) who hunted down people with darker skin in order to hand them over to the police. This might reveal one of the deeper reasons for the state to introduce the new law. The state had prepared the pogroms by public punishments of foreign ‘troublemakers’, by executions of ‘witches’ and absurd measures like a ‘homosexuality test’ for entering migrant workers. The official aim is the complete ‘Saudi-isation’ of the labour market, which is unrealistic. There is a lack of qualified labour, so a lot of posts cannot be filled with local workers. More importantly, the state would have to destroy the expectations of a whole generation not to have to engage in manual labour and to get complete social security guaranteed by the state. Therefore the Saudi state channels the increasing discontent amongst the local population towards the ‘foreigners’, criminalises the latter and subjects them to the arbitrary rule of their employers and the violence of a guided mob. But only the proletarianisation of the Saudi population will solve the problem of the state in the long run. This is difficult to achieve without causing a fundamental state crisis and the complete loss of legitimacy of the royal family. Once the Saudis fail to solve its ‘migrant workers question’ the fundament of a house of cards might collapse and would finally open a new perspective for the movements in the whole of the Middle East. Since the beginning of December, developments of the issues raised in the article have intensified and accelerated: the regime had reached a ‘point of no return’ above all with the massacre at Rabi’a al-Adawiyya square – state repression increasingly captures the entire political and social opposition and aims at a complete restoration of the police-state. Astoundingly, state repression has, up until now, missed its goal: neither has a deathly silence occurred in Egypt, nor has the country (despite some attacks directed against the security forces) slipped into civil war. By mid-November over 2600 people were killed according to the ‘revolution-wiki’ (Thawra-Wiki), which is put online by various human rights groups. Lawyers with close links to the Muslim Brotherhood say it’s over 7000. More than 21,000 people have been locked up (those are the ones whose arrest was registered by lawyers or NGOs), amongst which 3000 are members of the Muslim Brotherhood. The overwhelming majority (over 16,000) were arrested on the street at demonstrations. We underestimated the massive attack on the social infrastructure of the revolt and the attempt either to bring it under control or to destroy it. Across political and religious orientations there was a lot of support for the protests from the organised social sector of various religious and secular foundations and NGOs. Symbolic examples for this support are e.g. field hospitals that were set up at all street protests. Also in other social spheres such NGOs provide legal support, publicity and information etc. The deal between state and the non-governmental institutions, which had been maintained since the mid-1970s, to leave the ‘welfare for the poor’ to the mainly religious charities, which, in exchange, feel responsible to secure social peace, started to erode from within these institutions. The secular NGOs were attacked by the state, e.g. the raid of the Egyptian Centre for Economic and Social Rights (ECESR) on 19th of December 2013, which had been important particularly for the ‘labour movement’. People were arrested and parts of the office destroyed. On 23rd of December the bank accounts of over 1,000 NGOs were frozen by state decree. This affected mainly those NGOs close to the Brotherhood, but also those of the Salafist charity Gamiyya Shariyya and Ansar al-Sunna al-Muhammadiyya; all three together form the back-bone of the islamic welfare sector. The goal won’t be the complete destruction of these welfare organisations, given that the state would not be able (financially, organisationally) to replace them. But the people working there and those dependent on these organisations are supposed to subject themselves to state control. The islamist leadership actually intend to come to an agreement with the military government and to submit themselves to their power. Apart from the political repression against any opposition it was this state attack on the welfare organisations, which mobilised many people to take the streets, people who previously had nothing to do with the Brotherhood or were even opposed to it. From September 2013 onwards the first protests of Brotherhood-dominated student unions started at the universities (mainly the Azhar-University in Cairo, it is chiefly the central university for islamic theology and islamic law). The harsh reaction of the state only resulted in an expansion of the protests. In November twelve students were convicted in a fast-trial and sentenced to 17 years in prison for allegedly having taken part in the storming of the Azhar administration building in November. In this context the police returned to campuses, from which they had been demobilised by governmental decree in 2011. When a first student died during protests on campus the situation escalated further. The students would not let themselves be intimidated; instead protests also started at the universities in the provinces. The whole engineering department of the university in Zagazig went on strike for a week to demand the release of arrested students from different political organisations and against the police and state-sponsored thugs on university premises. According to Democracy Index (a local NGO, which publishes statistics on protests and demonstrations) a quarter of the 611(!) student protests between September and the beginning of November 2013 were about ‘internal university’ issues, such as canteen food and hostel accommodation, meaning that the social demands did not completely disappear under the blanket of repression. With the enactment of an extremely restrictive ‘protest law’ at the end of November, the military regime took on further (liberal) groups of the opposition. They’ve now also arrested ‘media icons’ of the revolt, such as Achmed Maher, the spokesperson of the April 6 Youth and put them into jail. Way too late, but now very clearly the April 6 Youth admit their mistake of having participated in the identitarian polarisation in Egypt and now position themselves against the coup. For the first time they called for a protest against the military, parallel to a protest of groups close to the Brotherhood, on 25th of January 2014. Breaking through the political polarisation, which is based on religious identities, is only possible through collective struggle – it’s an important and hopeful sign that this now seems possible again. Perhaps more significant than the relatively small liberal milieu (by now less than a hundred people turn up to their rallies), are the large numbers of Ultra groups. These were originally deeply divided on the question of the military coup; many had first supported (state) operations against the Muslim Brotherhood. Lots of others came out of the same milieu as a section of the ‘Young Brotherhood’. In the course of November, more and more took part in the street protests against the Junta or carried out their own protests, with the football stadiums going back to becoming places of clashes with the police. On the side of the people who actually oppose state violence in the name of the Brotherhood, there are, according to some observers, many that don’t identify with the conservative ideology of the Brotherhood. In the foreground was the fact that they offered social assistance in particular for working class women. It provides employment and welfare that the state unsatisfactorily can’t or won’t offer. To thematise and realise these concrete social demands and needs as such, to emancipate them from the state as well as organisations like the Muslim Brotherhood, would go beyond the current focus on direct state violence. The movement has hardly any goals outside of being a struggle against the state apparatus. Apart from those reasons set out in the article, it also has few opportunities to develop working class ‘economic power’. The number of strikes has gone down drastically, economy-wise the country continues to collapse. But it has seemingly learned a lot from other historical and contemporary examples (e.g. Latin America, notably but surely Syria) and avoids many traps. Perhaps their biggest merit at the moment is the fact that it has undermined the efforts of the ruling class to ignite a civil war. The fact that the movement has, so far, managed to avoid bigger communal conflicts is the main reason why it is able to maintain such an extreme tenacity despite all the blows and the excessive power of the enemy. Pronouncements by the Military Council that all those who take to the streets, “are Muslim Brothers,” is wrong. The fact that most of the media here simply regurgitates this, is pathetic. But you have to ask those people who actually go out on the streets in the name of the Brotherhood what their motivation is, rather than just keep on declaring that the spectre of “Islamism” is alive. It is quite telling that the faction known as ‘left-wing’, split from the Muslim Brotherhood early on. This happened after its most prominent representative Aboul Fotouh was expelled from the Brotherhood in mid-June 2011, due to the fact that he wanted to stand as a candidate in the presidential elections. He formed the party ‘Strong Egypt’. The NSF was lead by the social-democratic Nasserists Sabahi and Mubarak’s ex-foreign minister Amr Mussa and it also included the April 6 Youth and the Revolutionary Socialists. The essential integrating figure was Al Baradai, he was a top-diplomat under Nasser and Sadat and later general director of the International Atomic Energy Agency (IAEA). On the 24th of January 2013 the ‘Black Bloc’ presented themselves for the first time publicly as a militant arm of the movement against the imminent ‘dictatorship of Islam’. Some of them who were arrested as members belonged to the Ultra scene. But who actually stands behind it and how serious we should take their appropriation of the symbol of a global protest movement (the black bloc) is difficult to tell given the absence of a ‘libertarian milieu’. With the fall of Morsi the black bloc ‘officially’ disbanded. The spokesperson of the Tamarod campaign was the relatively unknown young journalist Mahmoud Badr, a campaign organiser of the Kefaya electoral alliance in 2006. He was also close to Al Baradai. On the institutional level Tamarod was supported by organisations of the National Salvation Front and mainly financed by the oligarch Naguib Sawiris. Abu Eita is a prominent co-founder the trade union of lower rank administration employees, which emerged out of wildcat strikes. He is a symbolic figure of the independent trade union movement. He is a member of the Nasserist Karama Party; ironically he won his parliamentary seat in the 2011/12 election from the FJP candidate list. Originally the Cordon Sanitaire was a term of the health police: the installation of an isolating belt around an epidemic area. Later on the term was politicised and referred to the creation of dependent buffer-states between different centres of power. The word ‘Malaise’ is supposed to emphasise the purely destructive policy of the Saudi state. This entry was posted in ΙΣΤΟΡΙΑ, ΝΕΑ ΑΠΟ ΤΟ ΜΕΤΩΠΟ and tagged ΑΙΓΥΠΤΟΣ, ΑΝΑΔΙΑΡΘΡΩΣΗ, ΑΥΤΟΟΡΓΑΝΩΣΗ, ΔΗΜΟΚΡΑΤΙΑ, ΚΑΤΑΣΤΟΛΗ, ΚΡΑΤΟΣ, ΜΕΤΑΝΑΣΤΕΣ, ΤΑΡΑΧΕΣ on February 25, 2014 by simeioseis.